Beer drinking locales are almost limitless: a long cross-country flight, your local watering hole, the comfort of your living room couch, a wedding, your neighbor's backyard BBQ, the ball game—I think you get the idea. But for my money, one of the most overlooked yet rewarding beer-drinking locales is the very brewery in which it was made. There are several reasons for this, not least of which is that you're getting the freshest damn beer you possibly can. You also have the opportunity (usually) to talk with the brewers who are responsible for the pint of goodness making its way down your throat. When I visited the Harpoon Brewery in Windsor, VT last year, I had already missed the scheduled tours for the day. Instead, I had a really good grilled cheese sandwich and a Harpoon sampler in their cafe, and then got to chat with head brewer Matt while he did his daily chores on the brewing floor. 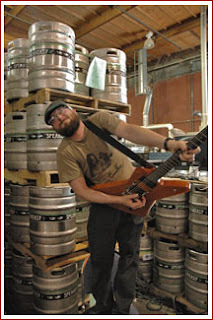 Most breweries are casual workplaces, with friendly staff who love to talk about what they do. 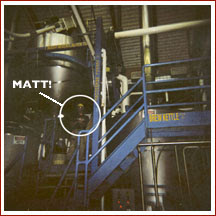 Matt was no exception, and he offered me a taste of the wort as we spoke. In an age where automation and marketing teams throw up a polished, impenetrable surface over the products we put inside our bodies and digest, this kind of hands-on interaction gives you a much better appreciation for food and drink. With over 1,300 craft breweries operating in 2006, you'd be hard pressed not to find a local brewery or brewpub near you (seriously—go do a quick search for a brewery near you). And many of these joints offer weekend activities like barbeques and concerts, where you can enjoy fresh hand-crafted brews, meet the folks who make it for you, and hang out with your friends. One of the best regular brewery events I've been to is the Speakeasy Saturday BBQ (although by regular, I mean semi-regular; get on their mailing list if you want to know about them in advance). Just like pretty much every brewery event, the flavor of the festivities directly reflects the brewery's own beer style. In Speakeasy's case, that means you'll get great rock 'n' roll, a down-home BBQ menu, and a family-friendly place to enjoy a local brew. Ten bucks gets you in the door with a pint glass and four drink chips, so this is pretty much the best deal in town. A couple of months ago I got to see some great pirate punk bands, and their last BBQ was all surf. So the next time you're trying to find a new place to drink, or you're interested in broadening your weekend plans, think about supporting your local brewery. You'll end up with good conversation, a belly full of deliciously fresh beer and who knows, you just might learn something from the guy or gal running the place!